We have lost FIVE law enforcement officers and one additional officer, who will most likely not survive. Just minutes ago, another officer was shot and is on the way to the hospital in critical condition. All in 3 days! 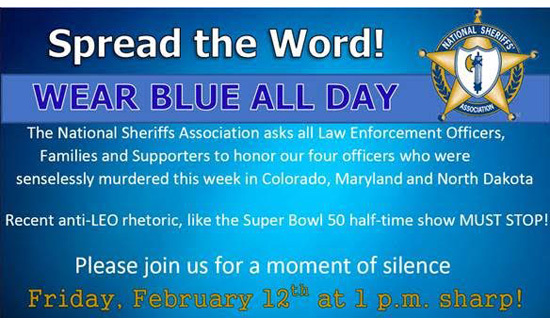 This is a sad week for law enforcement. 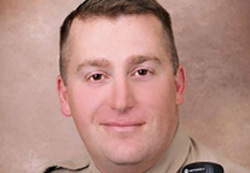 Mesa County, Colorado, Deputy Derek Geer was fatally shot. 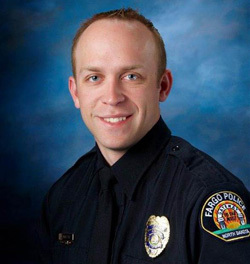 Fargo, North Dakota, lost Officer Jason Moszer, who was on the scene of a domestic call. He was shot and will not survive, according to the chief. Tulare County, California, lost a Sheriff’s Deputy (an 18-year veteran) and Pilot when their plane crashed while responding to a suspect brandishing a firearm. In Clayton County, Georgia, an officer has been shot and is being rushed to the hospital in CRITICAL condition. Join us tomorrow, FRIDAY, Feb. 12, at 1 PM EDT. The National Sheriffs’ Association encourages all law enforcement professionals, first responders, supporters, and citizens to Wear and Display Blue this FRIDAY and join us in a moment of silence to honor and remember the sacrifices of these fallen and injured deputies and officers at 1 PM EDT. 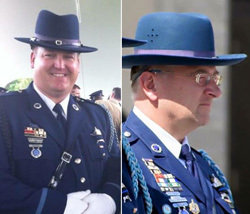 The senseless killing of four law enforcement officers just this week—on the heels of the anti-police “entertainment” at the Sunday Super Bowl halftime show—reminds us that the men and women in law enforcement take a solemn oath that includes putting their lives on the line every day to protect our citizens. For more information, visit www.sheriffs.org/wearblue. I am so sorry. Great men. They are heroes.